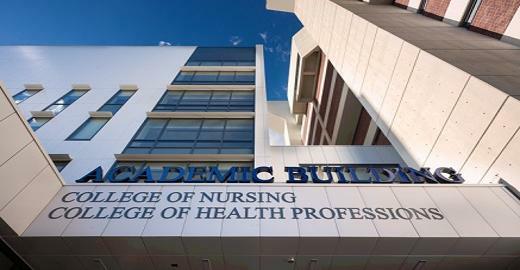 In September 2016, the College of Nursing moved from its former Cedar Street location into its new first-floor home in the New Academic Building. Team-based learning, distance learning, and interprofessional education will come alive in classrooms rich with technology and labs designed to empower the 21st century student. Students will be at the hub of the campus, with indoor accessibility from the CON to the Clinical Skills Lab, the Library, Upstate University Hospital and all the way to the West Parking Garage. A large, flexible lecture hall on the fourth floor will accommodate up to 349 students, making it the largest gathering space on the Upstate campus. The construction aligns with Upstate's commitment to stewardship of the environment, which aligns with the institution’s overall mission "to improve the health of the communities we serve." LEED Silver certification is being pursued from the U.S. Green Building Council. In Central New York, the vision to educate healthcare professionals to meet the needs of our current and future populations cannot be fully realized without a 21st century facility such as the New Academic Building. You can join the effort to strengthen nursing education in the CNY region with your gift today. Last Modified: June 26, 2018. Contact Alice Boyce with questions about the content of this page.